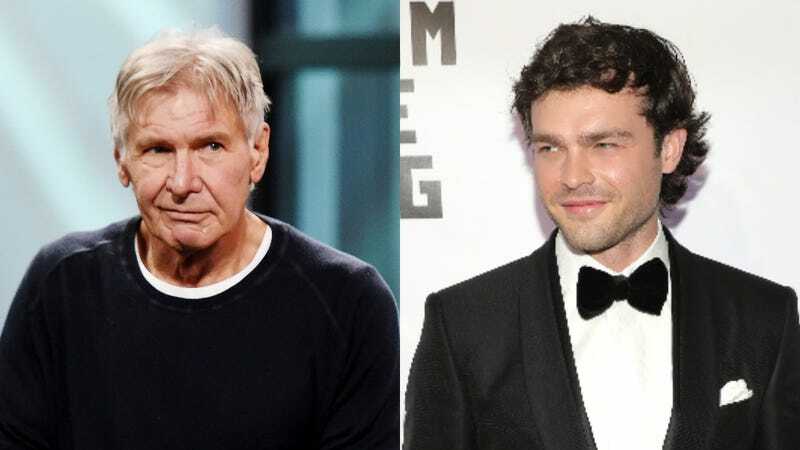 Harrison Ford's Han Solo advice to Alden Ehrenreich surprisingly wasn't "get out while you can"
Harrison Ford likes to present himself as a bit of a curmudgeon, even when his underlying goodness shines through his gruff exterior, but apparently he had a very productive chat with Alden Ehrenreich last year to discuss the actor’s then-upcoming role as the young Han Solo in Solo: A Star Wars Story. That’s according to Entertainment Weekly, which says Ford and Ehrenreich met for lunch before production started on the film, and while Ford “kept a respectful distance,” he did offer “some vital insights into the character.” Unfortunately, we don’t know what those insights actually are, as Ford apparently instructed Ehrenreich to keep quiet about everything he said. Ehrenreich says Ford told him to say that he gave him all of the advice he’d need but that he couldn’t tell anyone what it was, which may sound like a perfect “I’m Harrison Ford and I’m cranky” joke, but supposedly he really did give Ehrenreich some useful information on Han’s psyche. Lucasfilm head Kathleen Kennedy even says that Ehrenreich would occasionally recount things Ford had said at their meeting while they were filming Solo, which he probably couldn’t have done if Ford had only told him to pretend they had a good talk. Of course, there’s also the very likely possibility that Harrison Ford is just ecstatic that he no longer has to be Han Solo anymore, as he never publicly embraced the role like Mark Hamill has with Luke Skywalker. Perhaps he recognized this as an opportunity to let Ehrenreich fully take over the character, finally freeing him from the burden of that damn black vest and cool gunslinger belt. We're all Recommended here now, thank you. How are you?